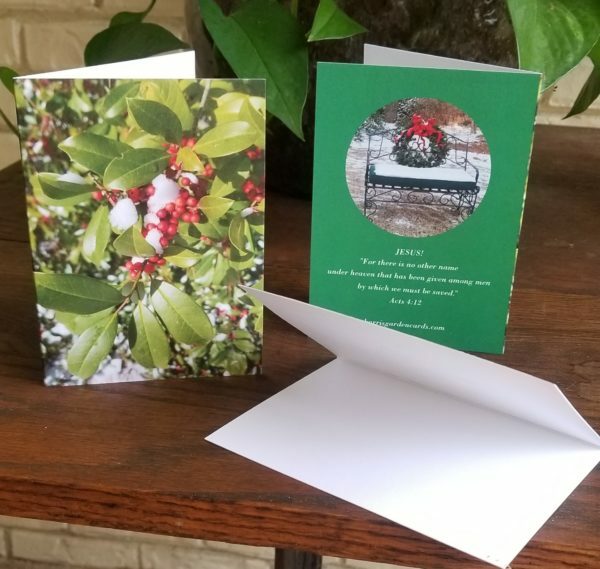 The 4 x 5.5″ folded cards with blank pages inside feature a photo of Savannah Holly leaves and berries on a snowy day. Four of these vivid note cards arrive in a clear package, adorned with a red or green bow. What thoughtful hostess gifts to leave with friends during parties, open houses, and dinners! 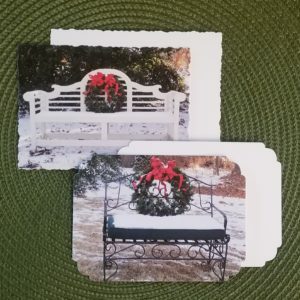 The 4 x 5.5″ folded cards with blank pages inside feature a photo of Savannah Holly leaves and berries on a snowy day. 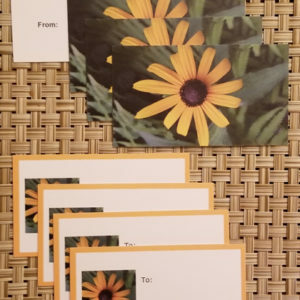 The back of each card includes a photo of a Christmas wreath on a garden bench with the Bible reference: JESUS! “For there is no other name under heaven that has been given among men by which we must be saved.” Acts 4:12 Designed to be seasonally appealing for your note writing during the winter, the space inside the card is ideal for penning messages of gratitude for gifts you received. 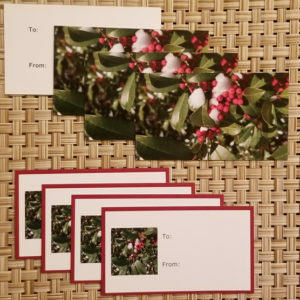 You can also use these visually stimulating cards to write your own personalized invitations to your family’s holiday events from Thanksgiving through January! As with all of our card products, high-quality white envelopes are included at no extra charge.